We are thrilled to begin the World Interfaith Harmony Week Coopetition today with the Global Compassion Torch in Sande Hart’s hands representing The Charter For Compassion Women And Girls Sector. Sande Hart holds the spirit of interfaith, love, compassion and action around the world. He life has many profound stories in inclusive community. Here is one inspiring story from Sande Hart that shaped her life into being a significant leader of compassion, interfaith, and build community to empower women and girls around the world. Here is today’s Champion of Interfaith Compassion, Sande Hart with the Torch. “On the morning of 911 I was shaken to a new understanding of the world. Within minutes of watching the news that morning I heard “Gather Women”. I had no idea what that meant. I did not know where I was suppose to find “the” women, and I had no idea who was whispering in my ear. Although I had no particular realization of my own spirituality, I still said, “yes”. Months later my rabbi invited me into a living room dialogues and I found them. I remember being quite intimidated to ask them for our own conversation of only women. I had no education in women’s studies or experience in community gathering, I was just following orders to gather women. When I first opened my mouth and asked, I was met with more immediate and enthusiastic “yeses!”. I immediately knew this organization could not be led by one woman but in shared leadership. I started with 2 new friends called her SARAH, the mother of all nations and the acronym Spiritual And Religious Alliance for Hope worked! 12 women were invited to our first meeting. I opened my front door, the women stepped in, and the I got out of the way. SARAH showed up on her own terms and in perfect time. Since then, we have a beautifully diverse Advisory Council, have hosted more than 165 sacred circle gatherings, produced countless community events, panel discussions, we have been featured in Harvard University’s Pluralism Project and University of California Irvine’s Ford Foundation Reports, co-sponsored more programs in collaboration with partner organizations than we can count, mobilized thousands of people out to hundreds of service projects, launched the Compassion Games in Orange and Los Angeles Counties, birthed the Compassionate California initiative before handing it off after it outgrew our arms, and traveled the world representing and presenting SARAH. With more than 650 SARAH Sisters globally, we are arguably the largest women’s interfaith organization in the world. But in my opinion, it’s the small sacred home meetings that have the most impact in our world. This video is a brief introduction of all the compassion and goodness SARAH women bless the world with. AMAZING!! 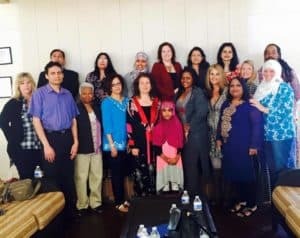 On January 21st at The Million Womens March in Los Angeles, we hosted a Red Tent. We knew the energy would be high and people would be pounding the pavement, but we also knew there would be so much internal processing and we wanted to provide the same sacred space in the midst of it all as we do in our monthly meetings in the warmth of one another’s homes. 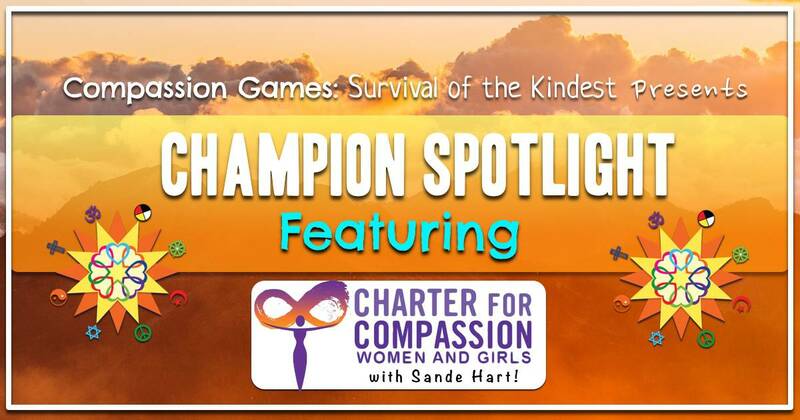 Sande Hart started the Women & Girls Sector with The Charter For Compassion in 2016 and has started a wild fire and sacred container for women & girls around the world. You can stay informed with this powerful interfaith global community on Facebook, Twitter, and Website too. The most recent event Champion of Interfaith Compassion, Sande Hart Co Hosted An Urgent Call from the Spirit of the Feminine, with Grandmother Flordemayo. You can learn more about these inspiring calls that are offered every 20 days. Here is a video of the call from last week. Stay informed on the latest events coming from Sande Hart on the Women & Girls Sector Facebook Page. Thank you Sande Hart for lighting the world with love, joy, and inclusion in Interfaith. Lets celebrate Sande and share this article with the world today. Share your reflections on this World Interfaith Harmony Week Compassion Relay on The Compassion Report Map. Learn about the Charter for Compassion World Interfaith Harmony Week Call today with tomorrow’s champion of compassion, The Interfaith Amigos. See the other inspiring calls offered this week & Sign up for the call here.